Looking for a big, bold online keno game that allows you to play for real money from the comfort of your couch? Check out Keno Blast, an action packed, easy to play keno game from NeoGames which will put your luck to the test for the chance to win some awesome cash prizes. 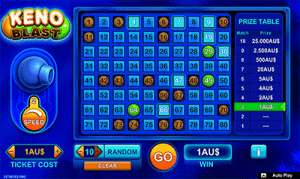 Discover how to play this exciting online keno game at the best Aussie-friendly casinos on the Web. Where can I play Keno Blast for AUD? Keno Blast is available at some of the top-rated online casinos, and is available for for instant-play directly over your Web browser without having to download any software. 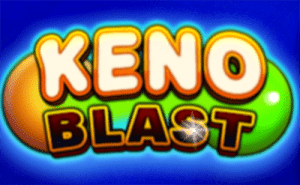 Keno Blast is also available for mobile play, making it one of the rare few mobile keno games which can be played for real money, while also offering the option of playing for free in practice mode. To play for free, just remember to click the ‘demo’ button instead. The team here at KenoSites has produced a new players guide for newbies and even returning players to brush up on the rules of the game. Keno Blast offers a game that really gets down to the point, with a bold blue game screen free from any distracting graphics or animations, while still offering an eye-catching platform and a funky soundtrack helping to set the pace. If you’re completely new to keno, Keno Blast is very newbie friendly so it’s the perfect starting point. It features a grid of numbers from one to 80, with a control to the left that shoots out the randomly selected winning numbers. On the left you can also control the speed of the game: one will give you a slow pace, two for a mid-pace and three will put the game into turbo speed. Head to a safe online keno site, sign up for an account and make an instant deposit to start playing for real money. Alternatively, you can use demo mode to try Keno Blast for free. Use the search engine in the instant-play game lobby to locate and load Keno Blast. At the bottom left of the game board, use the plus and minus buttons to select the size of your wager, with minimum bets starting at AUD $0.50 and maximums capped at $10.00 per game. Click on the keno board to select up to 10 numbers you hope will be lucky. Once you’ve selected a number, it will become highlighted with a lighter blue colour. Alternatively, you can click the ‘random’ button to have the computer select numbers on your behalf. You’ll also notice the prize table to the right hand side of the screen will automatically update based on the amount of numbers you have chosen. When you’ve made your bet and picked your number, click the ‘go’ button and watch as the chute to the side randomly shoots out 20 winning numbers. If you’ve placed a bet on a winning number, that number will become highlighted in green and marked on the prize table, with any wins automatically credited to your account. How much can I win playing Keno Blast? The amount you can win in Keno Blast (and any other keno game) is dependent on how many numbers you pick and the size of your bet. The more numbers you choose, the more matches you’ll need to make to win. For example, if you pick only three numbers in Keno Blast, you’ll only need to make one match to win a payout, but if you pick the maximum of 10 numbers, you’ll need to match at least three to win even the lowest payout. The more numbers you pick, the higher your payouts. To win the jackpot prize, you’ll need to pick and match 10 winning numbers. We know this can sound confusing, but just look to the prize table to the right of the game board, as this updates in real time every time you change the size of your bet or the amount of your picks, so you always know how much you stand to win. Is there a winning strategy in Keno Blast? Just like all other keno variants, Keno Blast is a luck based game with nothing the player can do to alter the outcome of the results. To win the most amount of money, the only real recommended strategy is to make sure you bet on the max of 10 numbers. Other than that, keno should be played with fun and entertainment at the forefront, while always betting within your means. For Aussie punters who want to try their luck on keno games online, head to William Hill’s Planet Lottery where you can bet on the outcome of several 24/7 keno draws from the comfort of home.